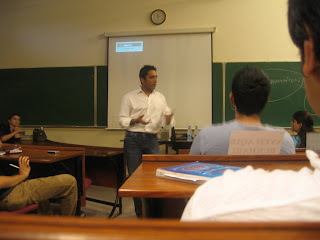 Shakeel Khokar, the Chief Executive Officer, Ogilvy and Mather visited Lahore School of Economics on May 30, 2007 and delivered a lecture to the BBA Students as a part of Lahore School Distinguished Professional Lecture Series. Lahore School of Economics MBA II 2007 students celebrated a Paindu Day on May 23, 2007. Colourful event was held in the Main Café at Burki Campus. Students dressed in typical attire displayed true rural culture. They also sang folk songs. To top it all, Famous Punjabi film “Choriyan” was also screened. Salman Danish, the Chief Executive Officer Media Logic (Pvt) Ltd and Ex Marketing Manager, Pepsi Cola International gave a talk to the MBA Marketing Students on May 26, 2007. Khurram Abbass, the Chief Manager Bank Alfalah Islamic Banking delivered a lecture to the BBA Finance Students on May 28, 2007. Lectures are part of Lahore School of Economics Distinguished Professional Lecture Series. Connie Mendes, the Recruitment Manager and Madiha Khalid, the HR Advisor from Shell Pakistan visited Lahore School of Economics on May 24, 2007 and gave a recruitment presentation to the graduating MBA / MSc Economics students. The recruitment presentation was followed by a session on “Improving Your Chances of Recruitment”. 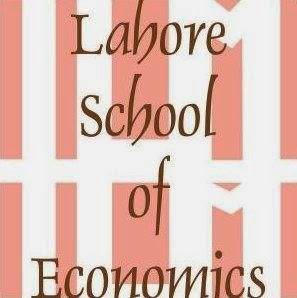 The Lahore School of Economics has started its Alumni Club in April 2007. Alumni Reunion for the Karachi Chapter was held at Marriott Karachi on May 10, 2007. Dinner was hosted by the Lahore School in honor of its Alumni. Some of the alumni gave useful suggestions and they appreciated the efforts of the Lahore School in this regard. Zahid Maqsood Sheikh, the Vice President IGI Investment Bank Limited and Ather Meer, Head of Human Resources, IGI Financial Services visited Lahore School of Economics on May 18, 2007 and conducted a session with the graduating MBA / MSc Economics classes. They also gave a presentation on their “Management Trainee Program 2007”. Lahore School of Economics Team - 1 (Haider Ali Khan, Ali Muratza and Ahmad Iqbal Chaudhary) reached quarter finals of the All Asians Debating Championship at Chung-Ang University, Seoul, South Korea. They were defeated by RVCE, India on a split decision of 2-1 on the motion that "This house would assasinate Kim Jong Il". The team had a record of 8 straight wins in the tournament and stood as the 5th top team of the competition. Lahore School of Economics Team 2 (Omer Imtiaz, Farhan Qasim and Khadija Imam) on the other hand were Octo-finalists and broke as the 10th top team ; they were defeated by the last year's champions MMU, Malaysia. The competition was attended by 100 teams representing 28 countries from Asia. Lahore School of Economics six members debating team left for Seoul, South Korea to participate in the Fourteenth All Asian Intervarsity Debating Championship to be held at Chung-Ang University, from May 6 to 13, 2007. The Lahore School debating team comprises of Mohammad Ali Murtaza, Ahmad Iqbal, Haider Ali Khan, Farhan Qasim, Omer Imtiaz and Khadija Imam. Sidra Rana is an adjudicator. DURING my visit to Pakistan last year, an old friend invited me to speak at the Lahore School of Economics, an autonomous, degree-granting private university. At the end of my presentation, the rector, Dr Shahid Amjad Chaudhry, took me to lunch and, as we partook of a fine meal, he invited me to teach a course of my choosing at his institution for a semester, if not longer. Following my return home and a few phone calls back and forth, I agreed to teach politics of Pakistan for the spring semester of 2007. Having completed that mission, I should like to share with readers my impressions and feelings. I taught at the school’s main campus, located in beautiful countryside, some 20 miles out of the city, on a road that goes to a small town called Burki. It is unlike any university campus that I have ever seen. It has an auditorium and a couple of large buildings that house its libraries. The administrative offices, classrooms, a hostel for women, and housing for visiting faculty are located in a series of structures that look like small and quaint brick cottages. The campus is spread out with acres of playgrounds, green lawns and walkways where peacocks, spreading out their splendid wings, roam around. Trees abound and so do all kinds of singing birds. The student body at this campus consists of about 2,000 of whom the majority are women. Considering the high tuition rates, it may be assumed that most of the students here come from affluent homes. They are well dressed and look attractive. But they are also a diverse lot. I saw men wearing beards and traditional native clothing, and others who were clean shaven and dressed in western attire. I saw women wearing the “hijab” and women wearing sleeveless blouses and pants or jeans. Yet, I saw none denigrating any who maintain their own distinctive lifestyles. This is essentially a school of economics and business management. Of late schools in this league have tended to include courses in the humanities and social sciences in their curriculum. Student interest in these fields is understandably peripheral and most of the courses in them are elective, not required. The class I taught consisted of 13 MSc and MPhil students. This was, on the whole, a gratifying experience for me. Until then politics for them had been no more than a passing topic of disparaging chit-chat in the cafeteria. But as the course proceeded they became interested, began to ask questions and generate discussion. Some of them challenged my interpretations, which made me happy. Judging by the grades they received at the end of the semester, it may be said that they all did reasonably well. Beyond their academic performance, they were a very pleasant, indeed a charming, group to interact with. The rector at the Lahore School is unlike any top academic administrator that I have ever known, and I have known quite a few of them. Learned and cultivated, he is a “gentleman of the old school,” who has seen a great deal of the world. He governs with affection more than strictness. He is kind to the school’s employees, as well as students, sensitive to their needs and problems, and generous almost to a fault. Yet his governance is a model of efficiency and effective. He has chosen his assistants with great care. Ms Romana Noor, a senior deputy registrar, runs the academic side of things in a most competent fashion. Then there is my good friend, Cecil Joseph, who manages the physical plant and the workforce. Under his supervision “operations” proceed like Swiss clockwork. Notwithstanding his stern bearing, he is capable of good humour and can be engaging company when he is so inclined. That should do for my experience at the Lahore School of Economics. Not only academic institutions but smaller groups of individuals (mostly retired civil servants) invited me to their clubs to discuss issues of concern to them: what the future held for Musharraf and his uniform, Benazir Bhutto’s career, the “non-functional” chief justice of Pakistan.I was not able to address their questions definitively, or even to my own satisfaction, because I did not fully know the answers. I could offer no more than intelligent and reasoned speculation on any of these matters. We know that General Musharraf would like to be president for another five-year term and remain the army chief at the same time. But that is only his wish, which may not be the proverbial “horse” he can ride. The legislative authorisation for him to keep both offices will expire on November 15, 2007. We cannot take it for granted that parliament will pass another bill authorising him to keep his uniform during a second term as president (2007-2012). In case he gives up his army post, the courts may hold that he is ineligible to contest the election for the president’s office. Again, if he gives up his army post, the electoral college (the national and the four provincial assemblies) may not re-elect him. Any number of persons may run for that office and one of them, other than a former army chief, may come out as the winner. Thus, it is hard to predict what General Musharraf will, or will not, be able to do after his present term expires. There may not be a “deal” between General Musharraf and Ms Benazir Bhutto at this time. But it is clear that she wants one. She says she is prepared to “work” with the general, and that cooperation between them is a “necessity” for Pakistan. She is beginning to be ambivalent on the subject of his uniform. One gets the impression that she is getting ready to desert Mr Nawaz Sharif and accept an arrangement with Musharraf even if he decides to keep his army post during a second term. Such a course of action will lower her in public esteem. But she says she is more concerned with the restoration of democracy than she is with her standing in public opinion. It is not known how her “cooperation” with the general will restore democracy. Ms Bhutto does not want to be a junior partner in a coalition led by PML-Q. She believes that if this party were to be returned to power, “creeping Talibanisation” of the country would continue. She claims that she will put an end to this process if her party comes to power. (Once again an unlikely outcome of an improbable event). She wants Musharraf to break his connection with PML-Q and adopt the PPP instead.But she suspects also that Musharraf has made the “strategic” decision to continue sponsoring extremists in Pakistan to convince the Americans that all would be lost if they were to withdraw their support from him. One may wonder why then she wants to work with him. In a fair and honest election, which is what she demands, PML-Q will probably lose quite a few seats in the National Assembly, that it had secured in 2002, to PML-N, especially in Punjab. In my reckoning the PPP, relying on its own devices, will win no more than 100 seats in a House of some 340 members. In other words, it will have to look for several coalition partners to be able to form a government. PML-Q will not want to be its junior partner in a coalition. Nor will the Islamic parties, or even the PML-N if by that time her conciliatory advances to Musharraf have alienated Mr Sharif, which is quite likely to be the case. It will be hard for Ms Bhutto to find allies unless the general, if he is still around, finds them for her, in which case she will owe her office to him and have to be accordingly subservient. What good will the office then be? Consider another problem. The Constitution in its present version disqualifies her for the prime minister’s office because she has held it twice before. The relevant provision will have to be repealed if she is to have her way. I doubt that the two thirds parliamentary majority required to pass another constitutional amendment will materialise if the purpose is mainly to satisfy Ms Bhutto’s ambition. The case of the “non-functional” Chief Justice is just as weird. His counsel says Article 209 does not authorise the president to file a reference against a sitting Chief Justice. But this article does not forbid him to do so. In many political systems that which the constitution does not forbid is deemed to be allowed. The office of the chief executive in most countries has implied and inherent powers beyond those specified in the constitution. That the charges against Justice Chaudhry may be bogus is besides the point. It is wrong to assume that the Constitution and law in Pakistan allow no recourse against a Chief Justice who may in fact be guilty of wrongdoing. Article 209 requires the president to refer the matter to the Supreme Judicial Council if he has reason to believe that a judge of the Supreme Court has been guilty of misconduct. I don’t think it can be argued that the word “judge” in this article does not apply to the Chief Justice. rticle 209 provides also that if a member of the Supreme Judicial Council is himself the accused in a case being enquired into, the judge next to him in seniority will replace him on the Council. That is why Justice Bhagwandas, next in seniority to Justice Chaudhry, the accused, is currently chairing the Council. Lahore School of Economics’ Third Annual Conference on Management of Pakistan Economy (Economic Reforms: The Road Ahead) concluded on May 3, 2007. A group of distinguished policymakers, academics, and international experts related to economic management presented their papers to the informed gathering. Dr. Ishrat Hussain inaugurated the Conference on May 2, 2007. Dr. Nadeem ul Haque, Shahid Kardar M. Ashraf Janjua and Dr. Nadeem ul Haq, Javed Masud, Mehak Ejaz, Dr. A R Kamal, Dr. Theresa Chaudhry, Shamyla Chaudhry, Dr. Naveed Hamid. Dr. Shakil Faruqi, Muhammad Arshad Khan, Dr. Abdul Qayum, Fasih-ud-Din, Dr. Naveed Zia Khan, Samina Shabir, Reema Kazmi, Dr. Azam Chaudhry, Kalim Haider and Dr. Eatzaz Ahmad were among the speakers in the annual conference of Lahore School of Economics.